A decision of primary importance in cell transplantation is the selection of cell type. Presented in this section is a survey of the major cell types investigated by various laboratories to date. The transplantation of fetal or neonatal cardiomyocytes into myocardial scar tissue is intended for directly restoring contractile function to tissue deficient in its own cardiomyocytes. The motivating hypothesis is that healthy, young cardiomyocytes can replace damaged cardiomyocytes. The feasibility of transplanting these immature cell types into the myocardium was initially demonstrated with rats in 1996. Studies reported transplant survival lasting to 2 mo (14,15) and improved cardiac function (increased ventricular wall thickness and attenuated chamber dilatation) after cryoinjury (16). In contrast, adult cardiomyocytes reportedly necrosed 1 day after transplant and were completely dead within 1 wk (17). It is believed that this difference was influenced by the enhanced mitotic potential of fetal/neonatal cardiomyocytes (and the relative mitotic inactivity of adult cardiomyocytes). and between the graft cells and the host have been observed (20,21). Phenotypically, immature cardiomyocytes have been reported either to advance to the adult phenotype (22) or to continue to express some fetal protein isoforms (14,18). Furthermore, animals receiving cardiomyocyte transplants elicited attenuated pathologies in the form of decreased infarcts (19), less ventricular enlargement, and reduced pathological remodeling (18,23). In one study, treated animals were reported to display enhanced ventricular function (24). Nonetheless, long-term graft-host integration has been unsatisfactory so far because competing scar tissue walls off transplants from host tissue and diminishes coupling proteins such as connexin-43 (23). Moreover, fetal/neonatal cardiomyocytes die easily in the face of ischemia and because of the shock of engraftment (25,26); they are not considered ideal for clinical use for additional reasons, including: (1) availability, (2) ethical issues surrounding the use of fetal/neonatal human cell sources, and (3) the immunosuppression required because of the allogeneic sourcing of cells. In the face of stresses such as trauma and heavy exercise, skeletal muscle is served by satellite cells that assist in repair and regeneration. Recruited satellite cells spawn skeletal myoblasts that proliferate, fuse into myotubes, and differentiate into functional muscle fibers. From a cell transplantation perspective, autologous skeletal myoblasts have numerous advantages. They can be easily harvested from the muscles (e.g., thigh) of a patient, and thus their transplantation would not require immunosuppression after administration. Because skeletal myoblasts are proliferative yet fully determined to the myogenic phenotype, they may be expanded in vitro and pose low risk for tumorigenesis in vivo. Myoblasts are somewhat ischemia resistant (27), unlike fetal/ neonatal cardiomyocytes. Moreover, reports have suggested that myoblasts may be capable of differentiation into not only myocytes, but also adipocytes and osteocytes in vitro (28,29), suggesting a mesenchymal differentiation potential. Previous studies on animal models for skeletal myoblast transplantation have demonstrated promising but inconclusive graft structures and functions in vivo. Skeletal myoblasts delivered into cardiac muscle show an affinity for myocardial scar tissue and form into myotubes, but do not form true cardio-myocytes (30). Cardiac proteins (e.g., N-cadherin and connexin-43) responsible for electromechanical syncytial cell coupling were produced in vitro, but were absent in vivo (31). Nevertheless, in studies of both small and large animals with infarcts, myocyte transplantation has reportedly enhanced left ventricular function (30,32-34). Preclinical results have been considered sufficient to warrant human studies. Subsequently, one case study centered on a 73-year-old man experiencing heart failure and with history of a heart attack and high blood pressure. Five months after autologous satellite cell transplantation, this patient exhibited significant improvement, as evidenced by an increased ejection fraction, attenuation of ventricular dilation, improvements in myocardial metabolism, and enhanced myocardial blood flow (35). Probing further, a phase I clinical trial studied the feasibility and safety of autologous skeletal myoblast transplantation in 10 human patients with severe ischemic cardiomyopathy. 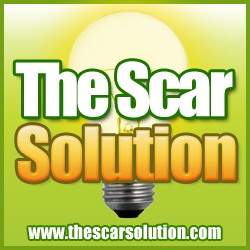 The key clinical finding among this group of patients was the restoration of their contractile functions in 63% of the previously akinetic, nonviable scar sites treated with myoblasts (36). All patients lived, with the exception of one 72-year-old man, who died of stroke 17.5 mo after transplantation. Postmortem histological analysis of his treated infarct revealed matured skeletal myotubes with an intact contractile apparatus. These graft cells exhibited upregulation of slow myosin isoform, suggesting that adult skeletal myoblast grafts had converted in vivo to slow-twitch fibers, which would be considered beneficial to cardiac function (37). A disadvantage of the adult skeletal myoblast approach is that their parent cell, the satellite cell, becomes scarce as patients age (and coincidentally experience greater risk for cardiovascular diseases) and thus might not be available in sufficient amounts when needed. Moreover, studies showed that transplanted myoblasts both fail to transdifferentiate into cardiomyocytes and electromechanically couple in vivo (30, 31,37). Unfortunately, transplanted myoblasts essentially do not behave or function like cardiomyocytes on a cellular level despite improving cardiac performance on a clinical level. Some have addressed this discrepancy by proposing that myoblast transplantation helps not by directly providing contractile work, but instead by beneficial interactions with host cells. More specifically, grafted cells might secrete molecular signals such as hepatocyte growth factor (HGF) that provide cardioprotective effects or mobilize cardiac stem cells (38). HGF reportedly improves postinfarction cardiac function in vivo (39), and on a cellular level, it has been shown to block apoptosis of cardiomyocytes in vitro (40). Moreover, in situ transfection with the HGF gene group reportedly enhanced adult myoblast transplantation in infarcted rat hearts, as evidenced by a reported increase in cardiac performance, neovascularization, and attenuated fibrosis (41). Nonetheless, care must be exercised because the HGF approach has also been implicated in tumorigenesis (42,43). In summary, adult skeletal myoblast transplantation has promising results in animal and human studies. Yet, further research is required to understand better its mechanism of action. Furthermore, larger randomized clinical trials are necessary to provide sustained evidence regarding its ability to ultimately benefit patients in need. Stem cells are defined by three properties: (1) the capacity for self-renewal; (2) the ability to differentiate into multiple, functional cell types; and (3) the capability to contribute to tissue formation in vivo. Stem cells can be categorized as either adult or embryonic. Currently, it is generally accepted that adult stem cells can differentiate into multiple, but not all, cell types (termed multipotent), whereas ES cells can contribute to nearly all tissues (termed pluripotent). The ES cell (44-49) is considered to have the capacity for unlimited self-renewal and pluripotent differentiation. Yet, adult stem cells have been identified in many tissues, with the best characterization for the hematopoietic stem cell (HSC) (50). Other adult stem cells that have been identified include neural (51-53), gastrointestinal (54), epidermal (55), hepatic (56), mesenchymal (57-60), side population (SP) cells (61,62), circulating endothelial progenitor cells (63), and multipotent adult progenitor cells (MAPCs) (44). The potential benefits of stem cell transplantation are illustrated in Fig. 3 (64). Human embryonic stem (hES) cell lines have been proposed as a self-renewing and inexhaustible source of nascent cardio-myocytes. Furthermore, their pluripotential poses the possibility of producing specific cardiac cell types, such as cardiac endothelial cells, atrial and ventricular myocytes, and pacemaker cells. In addition to their availability and versatility, hES cell-derived cardiomyocytes would also share the advantages described in Section 3.1.1.
cardiomyocytes within days to weeks (67,68). In the latter, hES cells were cocultured with mouse visceral-endoderm (VE)-like cells to induce differentiation (69). The authenticity of ES cell-derived human cardiomyocytes has been validated by a variety of means, such as reverse transcriptase polymerase chain reaction, immunostaining, electron microscopy, and electrophysiological measurements (67,68, 70,71). Yet, others have argued that these cardiomyocytes resemble those of the embryonic heart tube and not chamber cardiomyocytes (72). To date, reports on cardiac transplants of ES cell-derived cardiomyocytes are limited. One study demonstrated the feasibility of the method in dystrophic mice and survival of the transplanted cells reaching 7 weeks (73). Additional progress in animal studies as well as in the areas of purity, scale-up (expanding cell numbers), and immunorejection must be made before undertaking clinical trials with hES cell-derived cardiomyocytes. More specifically, purity remains a problem for the differentiation process, which byproduces a variety of noncardiac cell types; cardiac transplantation of such ill-defined and heterogeneous mixtures could be dangerous. Yet, progress has been made; one group of researchers has produced cultures >99% pure by genetically modifying mouse ES cells with a cardiomyocyte-specific promoter paired with a gene for G418 antibiotic resistance (73). Regarding scale-up, experiments thus far have only been on a relatively small laboratory scale, and mass production methods must be developed to generate adequate numbers of cells to replace the estimated 108 cardiomyocytes that die per heart attack in a given patient. Regarding immunosuppression, by current methodologies patients would require lifelong suppression because of the allo-geneic nature of cell lines. The banking of designer cell lines with extensive selections of human leukocyte antigen types, attenuation of cell line immunogenicity, and induced graft tolerance are among the methods to be investigated extensively to address these problems with immunorejection (74). A sizable body of scientific work has addressed the potential ability of some adult stem cells to transdifferentiate into cardiac cells, giving hope for future means to heal the dying or failing heart. Moreover, studies have shown that tissue-specific stem cells may even have the ability to generate the cells of tissues from unrelated organs. Yet, to date whether this unexpected plasticity constitutes "transdifferentiation" or whether a small population of multipotent stem cells persists in postnatal tissues is not known. However, the finding that stem cells exist in postnatal tissues with previously unknown proliferation and differentiation potentials may implicate the possibility of using allogeneic or autologous stem cells to treat myocardial infarction and perhaps even congestive heart failure. Adult BMSCs are considered a heterogeneous population of stem cells that originates from bone marrow and possesses the ability to regenerate various tissues (5-7). This purported multipotential is illustrated in Fig. 4 (11). It is known that the BMSC population is composed of a variety of subpopulations, such as HSCs (75), mesenchymal stem cells (MSCs) (58,76), and SP cells (77) (an enriched population of HSCs that gives rise to all hematopoietic lineages following transplantation). Fig. 4. The purported fates of bone marrow stem cells (BMSCs). 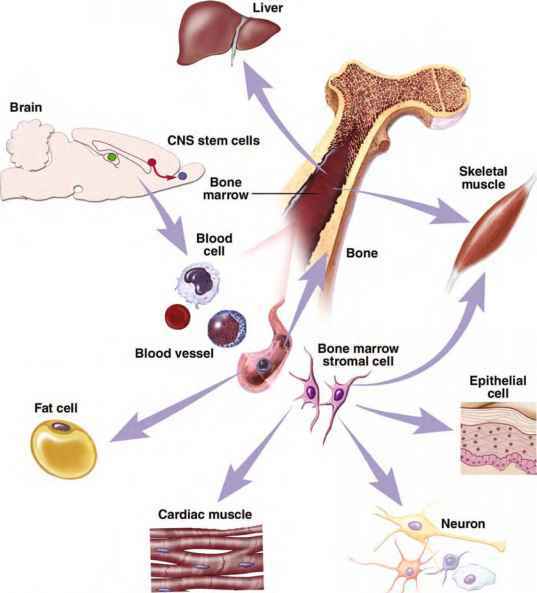 Bone marrow stem cells are believed to consist of a heterogeneous population of cells capable of transdifferentiation into a number of respective tissue types. Definitive evidence does not exist for all tissue types illustrated. © 2001 Terese Winslow. utilized, and what their respective mechanisms of action are. For example, BMSCs have also been called "marrow stromal cells," "stromal stem cells," "marrow mononuclear cells," and "marrow progenitor cells" (78). As shown here, a number of groups have reported that BMSCs can differentiate into a variety of cardiac cell types. Furthermore, some groups proposed specific subpopulations in their studies, whereas others generalized their cells as BMSCs. vironments in vivo are thought to stimulate the multipotential differentiation of BMSCs. More specifically, BMSCs adjacent to cardiomyocytes would transdifferentiate into cardiomyocytes, and similarly, BMSCs adjacent to endothelial or smooth muscle cells would transdifferentiate into vascular cells. In support of this, a recent in vitro study confirmed that direct cell-to-cell contact (and not soluble factors) with cardiomyocytes induced BMSCs to differentiate into cardiomyocytes themselves (84). From a cell transplantation perspective, autologous BMSCs have several advantages. BMSCs could be easily harvested from a patient by bone marrow aspiration and subsequently grown to large numbers in the laboratory. Furthermore, on transplantation there would be no need for immunosuppression because of their autologous sourcing. Moreover, there have been reports suggesting that allogeneic BMSCs might even serve as "universal donor cells" and thus obviate the need for immunosuppression (85,86). This would translate into a nonimmunogenic allogeneic cell source, permitting the on-demand delivery of cells to patients and precluding any need for scheduling autolo-gous cell harvesting, laboratory manipulation, and transplantation. To date, animal studies focusing on BMSCs have been promising. For example, in mice, Lin- c-kit+ (a surface protein marker state of hematopoietic lineage marker negative [lin-] and stem cell factor receptor positive [c-kit+]) BMSCs intramyocardially injected into acutely ischemic hearts formed cardiomyocytes and new vessels consisting of BMSC-derived endothelial cells and smooth muscle cells. Nine days after transplant, BMSC-derived myocardium occupied 68% of the infarcted regions (81). In a similar report by the same group, these mice also elicited increases in cardiac performance as evidenced by improvements in several hemodynamic parameters (87). The MSC, one of the more promising subpopulations of BMSCs, is well characterized (58,88) and has shown promise for use in cardiac regeneration both in vitro and in vivo. In rats, MSCs genetically reprogrammed with the Aktl prosurvival gene reportedly regenerated 80-90% of damaged myocardium, attenuated pathological remodeling, and normalized cardiac performance of the ischemic myocardia (89). Furthermore, stable graft formation with nascent muscle-specific proteins, reduced contractile dysfunction, and reduced heart wall thinning were all reported in pigs receiving autolo-gous MSC transplants 2 wk after myocardial infarction (90). Unfortunately, all 14 animals in this study progressed to failure at 6-8 wk. Nevertheless, human MSCs transplanted into the healthy hearts of immunodeficient mice hearts appeared to differentiate into cardiomyocytes (91). Our group has investigated a method for controlling the distribution of transplanted MSCs by entrapping them in a fibrin matrix that can be surgically secured adjacent to areas of infarcted myocardium. To date, initial in vivo findings have indicated a resultant significant left ventricular wall thickening, improved left ventricular contractile performance, minimal myogenic differentiation of MSCs, and significant neovascularization (92,93). This suggests that MSCs may work by increasing blood flow to infarcted areas as opposed to contributing any significant contractile function. Preclinical results were considered sufficient to warrant human studies. In one human study, six coronary bypass patients receiving intramyocardial injections of autologous AC133+ (a stem cell marker expressed in HSCs and neural stem cells) bone marrow cells exhibited subsequent increases in left ventricular function; five of these patients also elicited increases in myocardial blood flow (94). In another trial, autologous mononuclear bone marrow cells were transplanted into the ischemic hearts of eight patients who, 3 mo later, showed improved clinical symptoms and increased cardiac blood flows and function within the previously infarcted regions (95). In yet another study, 10 patients receiving intracoronary transplants of autologous BMSCs following standard heart attack therapy showed significant improvements in cardiac function compared to control patients receiving standard therapy alone (96). In the 3-month follow-up studies of the hearts receiving transplants, infarct size had halved on average, infarct wall velocity doubled, and patients exhibited significant increases in their stroke volume index, left ventricular end-systolic volume and contractility, and infarction blood flow in the previously infarcted wall region. The TOPCARE-AMI (Transplantation of Progenitor Cells and Regeneration Enhancement in Acute Myocardial Infarction) study bolstered feasibility and safety by treating 9 patients with autologous BMSCs (and 11 with blood-derived progenitor cells) a few days after their heart attacks. Findings from this trial at 4 mo included significant benefits to the left ventricle, including increases in ejection fraction, improved infarct wall motion, dramatically reduced end-systolic volumes, and enhanced myocardial viability in the infarcted zones (97). The specific subpopulations of BMSCs responsible for regenerating myocardial tissue remain unclear. 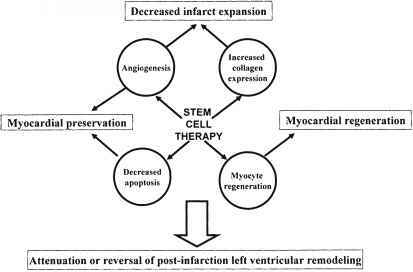 Evidence as discussed here showed that MSCs can contribute to myocardial regeneration. Conversely, evidence also suggests that certain subpopulations may not generate similar results, such as certain bone marrow HSCs. For example, lethally irradiated mice, each receiving single green fluorescent protein-labeled HSCs with surface protein markers c-kit+ Thy1.1loLinSca-1+, experienced robust reconstitution of their peripheral blood leukocytes, but negligible contributions to brain or liver and no contributions to kidney, gut, lung, skeletal, or cardiac muscle (98). In contrast, a CD34- subpopulation of HSCs (which are mostly CD34+), termed side population (SP) cells, reportedly were able to form cardiomyocytes and endothelial cells in inf-arcted mouse hearts (79). Bone marrow-derived SP cells typically comprise 0.05% of whole bone marrow and are defined by their ability to exclude Hoechst 33342 dye via multidrug resistance-like proteins (77). Their protein surface markers are CD34-/low c-kit+ Sca-1+ (79), similar to HSCs. In addition, other similarly Hoechst dye-effluxing SP cells have also been isolated within skeletal muscle, brain, spleen, liver, kidney, lung, small intestine, and the heart itself (61). There is additional evidence that SP cells can specifically contribute to the regeneration of various tissues, including skeletal muscle (99), vessels (100), and breast (101). Of interest here is that heart-derived SP cells have also demonstrated the ability to form cardiomyocytes in vitro (102). To date, studies of SP cell transplantation into animal models of infarction have yet to surface. Moreover, it remains to be seen whether there exist multiple tissue-specific SP cell types or a single SP cell type that distributes itself hematogenously from a common source such as bone marrow (103). It should be noted that it is possible that a number of the BMSC transplantation studies discussed in this chapter either unknowingly employed or unknowingly excluded SP cells. This will need to be clarified by conducting specific SP-cell-only vs non-SP-cell-only transplantation experiments on animal models of infarction. MAPCs are cells that are considered to proliferate without senescence and differentiate into mesodermal, neuroectodermal, and endodermal cell types (45). MAPCs are a subpopulation of BMSCs that has been well characterized as "CD34, CD44, CD45, c-KIT and major histocompatibility complex MSC Class I and II negative; expressing low levels of Flk-1, Sca-1 and Thy-1, and higher levels of CD13 and stage-specific antigen 1 (SSEA-1)." MAPCs reportedly also exist in both muscle and brain (104). Although there are no published studies of MAPC transplantation into injured hearts, there is some evidence that MAPCs can contribute to the myocardium. In one study, MAPCs injected into a mouse blastocyst model and examined 6 through 20 wk later in development were found distributed and functionally integrated in a variety of tissues, including skin, skeletal muscle, liver, small intestine, kidney, spleen, and myocardium (45). 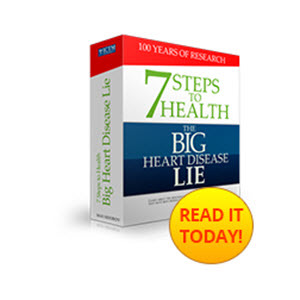 Findings have indicated that regenerative stem cells may normally exist within the myocardium. In addition, two populations with differing features have been reported thus far: Sca-1+ cardiac progenitor cells and Lin- c-kit+ cardiac stem cells. The former type is believed to play a role in cell fusion mechanisms, whereas the latter type is not. Adult heart-derived cardiac progenitor cells are stem cells isolated from the myocardium. They are chiefly identified as Sca-1+ and are considered an SP cell type. Studies employing purported mouse cardiac progenitor cells have shown in vitro differentiation of such cells into cardiomyocytes on 5-azacy-tidine treatment. Furthermore, in a mouse model of myocardial infarction, transplanted cardiac progenitor cells have been observed to home and engraft into the damaged myocardium and have differentiated into cardiomyocytes with and without cell fusion (9). However, whether they improve cardiac function after injury remains to be seen. To date, investigators have asserted the uniqueness and legitimacy of cardiac progenitor cells via surface protein markers. Cardiac progenitor cells are identified as Sca-1+ cells and are largely CD31+ and CD38+. Like bone marrow SP cell types, they efflux Hoechst 33342 dye, but differ by being negative for CD45 and c-kit. They are also negative for "blood cell lineage markers (CD4, CD8, B220, Gr-1, Mac-1, and TER119), c-kit, Flt-1, Flk-1, vascular endothelial-cadherin, von Willebrand factor, and HSC markers CD45 and 34," suggesting a nonhe-matopoietic and nonendothelial origin (9). Although no reports have yet surfaced using this cell type for cardiac cell transplantation, some investigators have suggested that the mesenchymal subpopulation of umbilical cord blood stem cells would be capable of multipotential transdifferentiation (105,106). Umbilical cord blood is easily obtainable from its source tissue, normally discarded after childbirth. In addition, cord blood is reported to contain high levels of stem cells and be of low risk for both viral contamination and graft-vs-host disease (107). The clinical application of cellular therapies demands autologous (i.e., patient's own) cells to avoid the immunological rejection that would occur if allogeneic (i.e., someone else's) cells were used. However, obtaining sufficient quantities of an autologous and desired cell type is likely to be difficult in the sick and elderly. One group of investigators has shown that bone marrow-derived MSCs can multipotentially form cells of bone, cartilage, tendon, fat, skeletal muscle, and heart muscle both in vitro and in vivo (108). Furthermore, fetal sheep systemically administered human MSCs that integrated into multiple tissues during a 13-month period also were shown to differentiate in situ into bone marrow stromal cells, thymic stromal cells, chondrocytes, adipocytes, skeletal myocytes, and cardiomyocytes (86). Thus, MSCs appear to maintain their multipotency after transplantation, suggesting their potential usefulness in cell transplantation for myocardial repair (86). To date, it remains somewhat unclear how adult stem cells may multipotentially differentiate; a definitive mechanism for inducing the cardiomyogenic differentiation of MSCs in vitro has not been reported. Although specific physiological induc-ers have been shown to drive MSCs to differentiate in vitro into bone, fat, and cartilage (58), the appropriate physiological inducer for cardiomyogenic differentiation of MSCs remains uncertain. Among the candidate promoters is 5-azacytidine, a cytosine analog that has been shown to decrease deoxyribo-nucleic acid (DNA) methylation in mammalian cells and consequently to promote reprogramming of the cell differentiation fate. Furthermore, in experiments employing the C3H10T1/2 mesenchymal progenitor cell line, 5-azacytidine was shown to induce differentiation into mesenchymal cell types such as skeletal myocytes, adipocytes, and chondrocytes (58). More specifically, up to 30% of MSCs treated with 5-aza-cytidine differentiated into spontaneously beating cells and expressed atrial natriuretic peptide, brain natriuretic peptide, ventricular/atrial myosins, desmin, actinin, and cardiac a-actin, all considered indicative of a fetal ventricular cardiomyogenic phenotype. Interestingly, such cells also expressed several cardiomyocyte-specific transcription factors, such as Nkx2.5/ Csx, GATA4, TEF-1, and MEF-2 (109). Such MSC-derived cardiomyocytes have been termed bone marrow-derived regenerated cardiomyocytes or CMG cells (110). Further analysis of CMGs also revealed functional adrenergic and muscarinic receptors, which are normally considered to play crucial roles in mediating heart rate, conduction velocity, contractility, and pathological events such as cardiac hypertrophy. Therefore, expression of such features makes CMG cells strong candidates for cell transplantation. Fibroblasts are an essentially ubiquitous cell type in the human body that some investigators have proposed as an alternative cell source. Normally, fibroblasts do not afford contractile function, but there have been some groups reporting success in reprogramming fibroblasts into myogenic cells in vitro with the MyoD gene and demonstrating the feasibility of transplantation in rat and mice models (111,112). Clinically, such an approach has promise because fibroblasts could be easily harvested because of their natural abundance, grown to large numbers in the laboratory, reprogrammed into cells able to do cardiac work, and finally reintroduced into the same patient as therapy. Somatic cell nuclear transfer has also been proposed as an alternate source of cardiomyocytes. This technique involves replacing the nucleus of a host oocyte with the nucleus of a somatic donor. The widely publicized sheep named Dolly was produced by this method (113). Researchers have used this method in a bovine model to produce cardiac cells that were both viable and tolerated following transplantation into the original donor animal (114). Vascular endothelial growth factor (VEGF) is known to encourage the proliferation of new capillaries. Cells modified to express VEGF or related factors may thus have the potential to ameliorate scar formation in injured myocardia. In support of this concept, in scarred rat hearts, researchers have reported angiogenesis and increased regional blood flood caused by the administration of heart cells engineered to produce VEGF at sixfold normal levels (115). However, it should be noted that conflicting reports have shown that VEGF-enhanced cells may contribute to tumor formation in the hearts of mice and rats (116,117). Moreover, in humans receiving stem cell transplants, VEGF has been implicated in the pathogenesis of hepatic venoocclusive disease (118). Accordingly, attempts are being made to control the expression of VEGF by means such as genetic control elements and polymeric delivery systems (119). In the future, conventional electronic pacemakers may eventually be replaced by genetically engineered cells with custom-tailored pacemaking abilities. Specifically, investigators have moved toward generating cardiac cells with novel electrophysi-ological properties intended to correct arrhythmias and other electrical abnormalities in the heart. Both contractile and conductory cells of the heart have been targeted, with specific electrophysiological modifications induced by manipulating the genes of ion channels within those cells (120-122). Defying or modifying rates of apoptosis (programmed cell death) caused by ischemia is another desirable property under investigation. Investigators have manipulated cytoprotective, heat shock, and inflammatory pathways to prevent cardiac cells from entering apoptosis (26,123,124). Others have employed ex vivo retroviral transduction methodologies to create MSC lines that overexpress the Aktl prosurvival gene. Interestingly, rats receiving such cells have elicited a reported 80-90% regeneration of damaged myocardium, attenuated pathological remodeling, and normalized cardiac performance in the ischemic myocardia zones. Compared to control cells transduced with the lacZ reporter gene, the Aktl cells repaired fourfold more myocardial volume (89).